Corfu Island, the verdurous island of the Feakes, which was the last stop of the Homeric hero Odysseus before his return to Ithaka, is one of the most famous Greek islands, as well as one of the most popular holiday destinations worldwide. Corfu has an area of 591 km2 and a population of 111.975 inhabitants; it is a cosmopolitan island, where the visitor can combine relaxed and restful holidays to entertaining evenings and intense nightlife. This is why Corfu, as a vacation destination, can satisfy even the most demanding visitor. The island has been and still is a meeting point of civilizations that have left their mark on the language, the mentality, the cuisine and the Corfiot architecture. 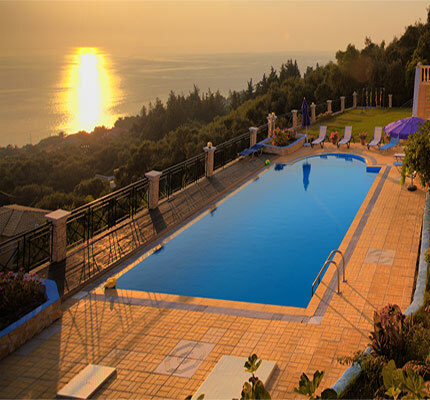 Museums, Palaces, libraries, Churches, Fortresses, Archeological sites, sites of special natural beauty, such as pretty little country churches, picturesque settlements and small ports, verdurous olive grove forests and sandy, crystal-clear beaches compose an enchanting puzzle called Corfu! Paramonas village is located in the south west coast of Corfu Island, below the village of Agios Mattheos.A few traditional tavernas can be found scattered around the surrounding area also a kiosk. Paramonas beach is covered with soft sand and pebbles on the side and large rocks on the other creating an imposing surrounding. The beach is fully equipped with sun beds and umbrellas. Paramonas is a good destination for nature lovers where the peaceful environment and the green landscape will captivate you from the first sight. The lush green region offers a variety of choices, from nature hikes to family picnics.